My group uses a wide variety of chemical and biophysical approaches to answer fundamental questions focusing on nucleic acids (RNA and DNA) and proteins that are involved in translation of the genetic code and viral replication. Members of this ancient family of proteins catalyze the esterification of an amino acid onto the 3′-end of tRNAs, which translate the genetic code through codon-anticodon recognition. Figure 1 depicts the evolutionarily conserved 5¡Ç-monophosphate that is critical for efficient aminoacylation by E. coli and S. cerevisiae HisRS. By virtue of their specific recognition of tRNAs and their capability to discriminate among structurally similar amino acids, the aminoacyl-tRNA synthetases play a central role in assuring a high degree of accuracy in protein synthesis. Site-directed and atomic group “mutagenesis” are common methods used in the lab to probe tRNA recognition. The latter approach allows us to identify specific functional groups that contribute to synthetase recognition of RNA substrates. Overuse of antibiotics in combination with increased numbers of immunocompromised patients has led to a dramatic increase in the incidence of antibiotic resistance. The aminoacyl-tRNA synthetases are an essential family of enzymes offering up to twenty targets per pathogen. With this in mind, we are probing species-specific differences in substrate recognition for drug design and to gain insights into the development of aminoacylation systems through evolution. In comparison to our understanding of tRNA discrimination, relatively little is known about the mechanism synthetases use to discriminate amongst structurally related amino acids. 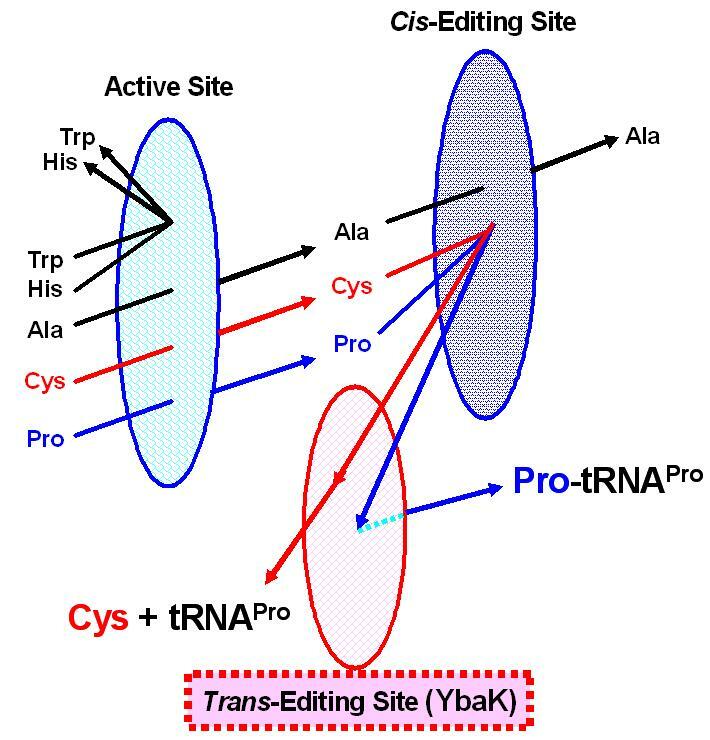 To correct misactivation of noncognate substrates, many synthetases require editing activity, and studies aimed at understanding the mechanism of translational editing are also underway. Figure 2 demonstrates a novel triple-sieve mechanism for ProRS editing that has been proposed by our lab. One goal of this work is to use our knowledge of amino acid recognition and editing to engineer novel synthetase-tRNA pairs for the incorporation of unnatural amino acids into proteins in vitro and in vivo. During the life cycle of HIV, its RNA genome must be converted into DNA. This conversion is catalyzed by reverse transcriptase, an enzyme that uses a specific host cell tRNALys molecule as a primer. The process by which HIV selects and uses a specific primer tRNA is not well understood, but we have recently shown that human lysyl-tRNA synthetase (LysRS) is also packaged into HIV and appears to be a critical factor in specific tRNA packaging. Ongoing work is aimed at elucidating the molecular interactions between human LysRS and HIV proteins. Figure 3 illustrates the propsed tRNA packaging complex for HIV-1. In vivo, the tRNA primer and the HIV RNA genome must be unwound and annealed together before reverse transcription can be initiated. The annealing process is mediated by the HIV nucleocapsid protein (NC), a nucleic acid “chaperone” protein that facilitates nucleic acid rearrangements (Figure 4). We have reconstituted in vitro systems that closely mimic several steps of the reverse transcription process in HIV to elucidate the mechanism of NCs chaperone funtion. Experimental approaches we are currently using to elucidate key nucleic acid-protein interactions in this system include fluorescence resonance energy transfer (FRET), chemical footprinting, and single molecule DNA stretching.